Honda Civic is no new name in the automotive industry. Honda has been gaining accolades for this model since the early seventies and has commendably kept the legacy intact. Introducing the tenth generation of line up, company unveiled its Honda Civic Sedan 2016 at the New York Auto Show 2015. Offering some new engine options, luxurious exterior and a comfortable and spacious interior the model undoubtedly has the traits to steal the gleam. 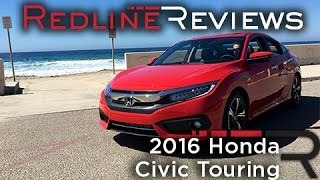 Let us have a look at the review of Honda Civic Sedan 2016 to know more about it. The interior of Honda Civic Sedan 2016 is almost the entire revive in comparison to the last year model. The reason behind this is very clear, all the criticism that the predecessor model faced. The first thing that will come across you is the lots and lots of space inside the model. The model gets a low planted floor and thus the ride height too gets low by an inch subsequently improving the visibility. The dashboard gets a cleaner look with many of its controls now being operated through the touchscreen. The material used inside the cabin also gets fine in terms of touch and looks but the piano black finish with high contrast silver bezel used for the center console is impeccable. 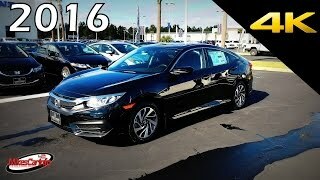 Apart from all these there’s a lot in the interior of Honda Civic Sedan 2016 to win your heart and to make this model a lap ahead of its predecessor. Just like its interior the exterior of Honda Civic Sedan 2016 is gem of a creation, especially the sharp and deep edges across the body. Starting with the front fascia model has the narrow designed headlights sitting at the either side of the traditional grille with a stronger grille blade. Bumper has a set of fog lamps on either side while the center area is occupied by the large air vent. Moving towards the rear end you’ll notice body-colored rear view mirrors and chrome door handles. At the rear end the dual-exhaust tips with the rest of styling might recall the predecessor models but overall the exterior of Honda Civic Sedan 2016 takes the gleam and makes the model gain commendable accolades. The Honda Civic Sedan 2016 comes in five variants namely, LX, EX, EX-T, EX-L and Touring. The first two variants are housed with a 2.0 Liter Four-cylinder engine generating total output of 158 hp and peak torque of 187 nm while the latter three come with 1.5 Liter CVT engine cranking total output of 174 hp and peak torque of 220 nm. 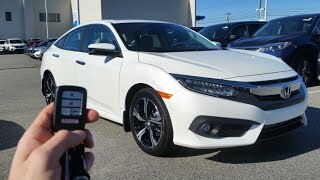 The performance figures of Honda Civic Sedan 2016 variants are not yet shared however we expect them to be out very soon and simultaneously assure to share them at the earliest.